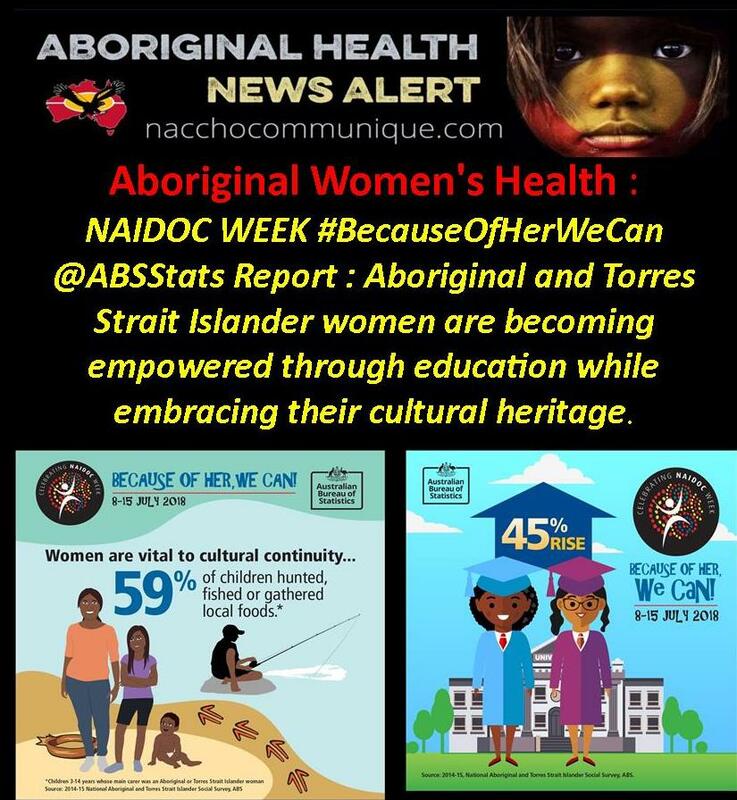 NACCHO Aboriginal Women’s #WeCan18 Health : #NAIDOCWEEK #BecauseOfHerWeCan @ABSStats Report Aboriginal and Torres Strait Islander women are becoming empowered through education while embracing their cultural heritage. 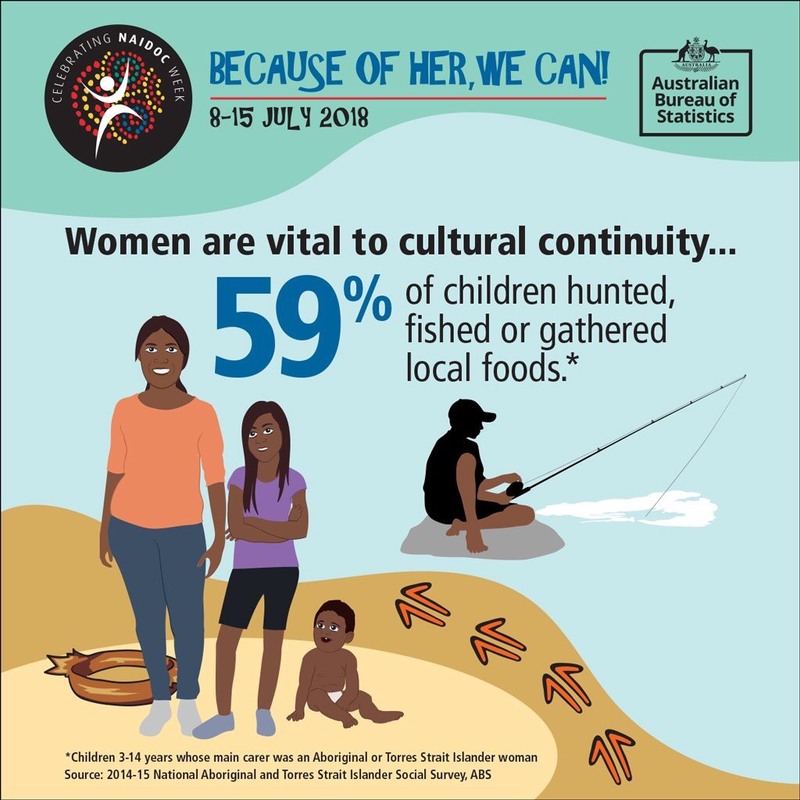 “As mothers, aunts, grandmothers, sisters and daughters, Aboriginal and Torres Strait Islander women continue to play a pivotal role in leading and supporting communities, providing support for those around them and guiding the next generation and this is celebrated with the 2018 NAIDOC week theme: Because of her, we can! 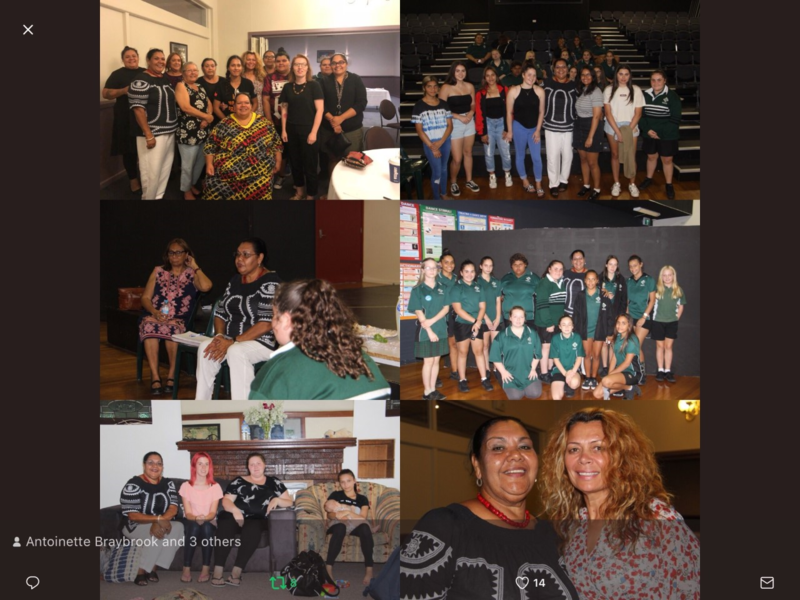 Increasing numbers of Aboriginal and Torres Strait Islander women are becoming empowered through education while embracing their cultural heritage. They strengthen and support their communities, and provide a stimulating environment for the next generation of children. Have you been chosen for the Aboriginal and Torres Strait Islander Health Survey? ” In our culture, our mothers, sisters aunties and grandmothers are highly respected and are the key to keeping families and culture strong. Education is giving us women and our communities hope and opportunities to be even stronger. 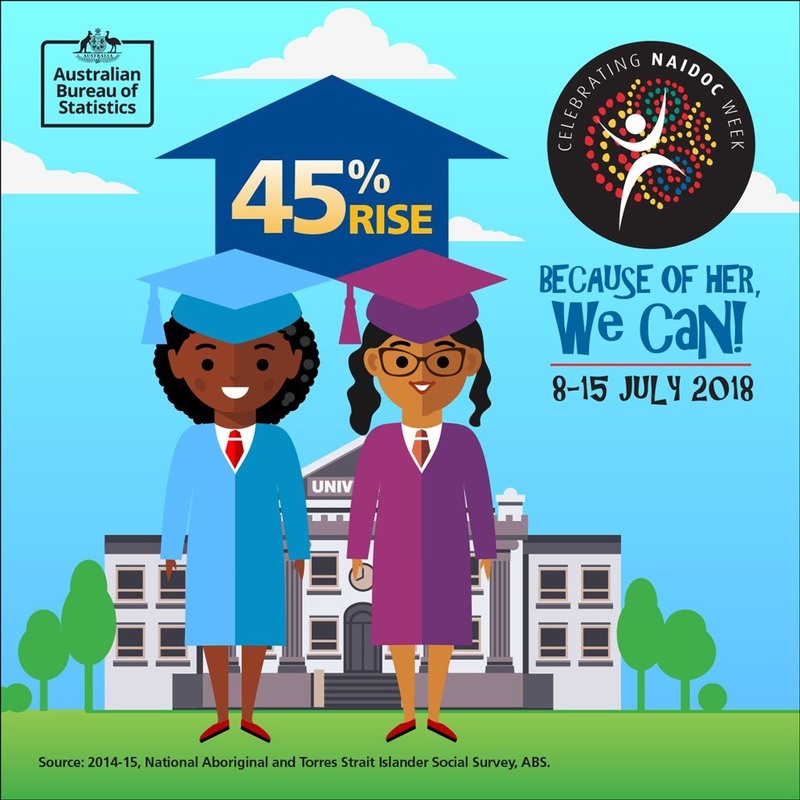 Aboriginal and Torres Strait Islander women are increasingly engaging in formal education and are achieving higher academic levels that ever before. 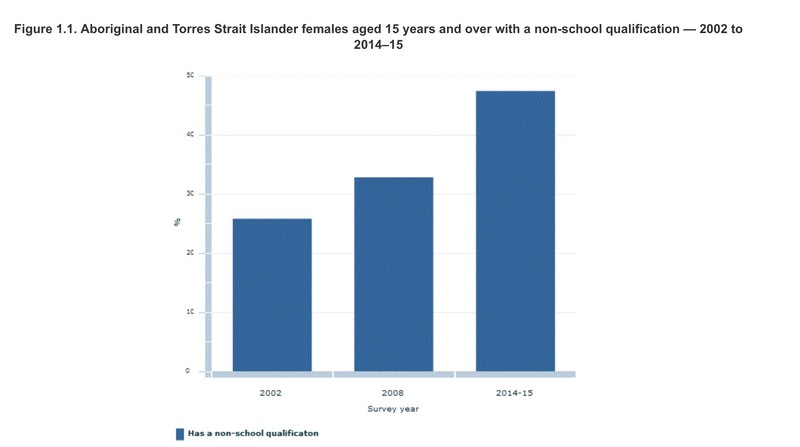 In 2014-15, almost half (47%) of Aboriginal and Torres Strait Islander females aged 15 years and over had achieved a Certificate, Diploma or Degree. The proportion of women whose highest (non school) educational attainment was a Certificate doubled between 2002 and 2014 (up from 17%to 34%). Similarly, the proportion of women holding a Diploma level or higher qualification increased from 7% in 2002 to 12% in 2014-15. Engaging in learning can lead to better employment, health and social outcomes, with the transition from education to work often smoother for higher education graduates than those entering the workforce directly from school. Providing care and support both within and outside of the household, Aboriginal and Torres Strait Islander women play an enormous role in strengthening social and family networks in the community. In 2014-15, three out of ten women (30%) cared for someone in need (with a disability, a long-term health condition or old age). Women in the age group 45-54 years were among the most likely (35%) to have provided care to a person in need. Women living in Remote areas were more likely to provide care than those in other areas (36% compared with 28%, reflecting a combination of factors such as reduced access to services, closer family networks and strong communities relationships. Additionally, three out of five women (61%) provided support to someone living outside of their household. Almost two thirds (61) of these women lived in a household with dependent children. Women are most commonly the main carers for their community’s children and therefore play a key role in a child’s learning pathway. In 2014–15, almost two-thirds (65%) of Aboriginal and Torres Strait Islander children aged 0–14 years had a main carer who was an Aboriginal or Torres Strait Islander female. As children grow, the positive experiences they have with their main carer (and other prominent people in their lives) influence development and often lead to better outcomes as they mature into young adults. The vast majority (95%) of children aged 0–14 years, whose main carer was an Aboriginal or Torres Strait Islander female, spent time engaged in informal learning with that carer. Between 2008 and 2014 there were increases in the proportion of women engaging with a child in playgroups, and also those assisting with homework or educational activities (increases of 52% and 17%, respectively). Time spent with a child taking part in cultural or informal learning activities is an investment in their future, and can boost a child’s confidence academically and socially. Aboriginal and Torres Strait Islander communities work together to educate, nurture and support children. In 2014–15, most children (69%) aged 3–14 years, whose main carer was an Aboriginal or Torres Strait Islander female, participated in selected cultural activities in their community. Popular activities included hunting, fishing or gathering local foods (59%), and creating Aboriginal or Torres Strait Islander arts or crafts (25%). Yesteryear, our grandmother regularly invited women into her house on Coranderrk Aboriginal Station Healesville. One of the mission management rules was to say prayers in the evening. Jemima closed the door and pulled the hessian curtains across the window. 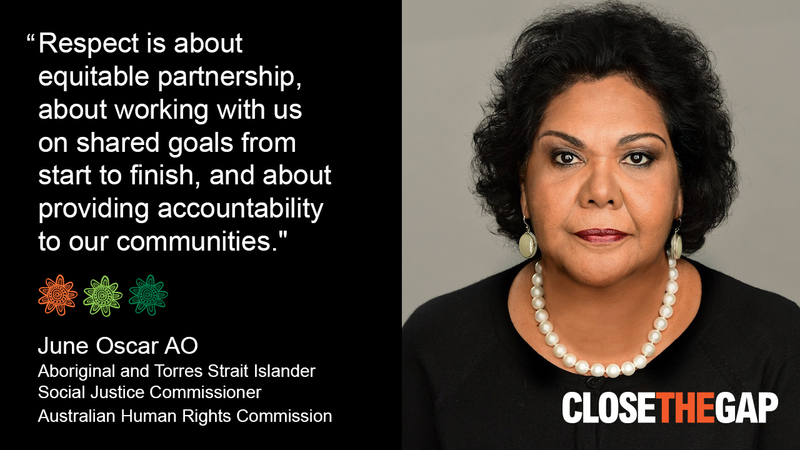 Aboriginal and Torres Strait Islander women have an important role in passing on knowledge and leading successive generations through their cultural journey. In 2014–15, 85% of Aboriginal and Torres Strait Islander women participated in, watched, or attended a cultural event or activity. Three-quarters (75%) of women aged 15 years and over recognised an area as homelands or traditional country and three-fifths of women (63%) identified with clan, tribal or language group. In 2014–15, most (73%) Aboriginal and Torres Strait Islander women either lived on or had access to homelands. Of those with access to homelands, almost half (48%) did so at least once per year. Between 2002 and 2014–15, the proportion of women reporting a connection to homelands has steadily increased (Figure 1.3), suggesting that over time women are increasingly embracing and connecting with their spiritual and cultural heritage. Antoinette Braybrook from the Family Violence Legal Prevention Service told BuzzFeed News Indigenous women are often forgotten about in the national conversation around family violence. “Aboriginal mothers die from external causes like accidents, suicides and homicides at a rate over six times higher than other mothers in Western Australia. And in most cases they left behind very young children, with traumatic results. Those are the grim findings of a study by the Telethon Kids Institute, which crunched data from four State bodies for the 27 years between 1983 and 2010. “Maternal loss can have a particularly traumatic impact on children and their development,” said one of the study’s authors, Dr Carrington Shepherd. 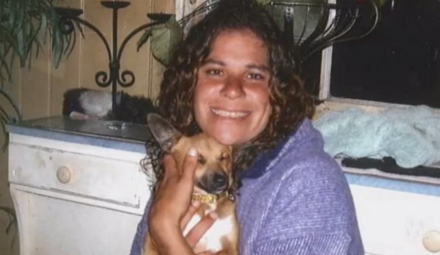 Aboriginal woman Andrea Pickett, a mother of 13 children, was killed by her estranged husband Charles Pickett who stabbed her 17 times in North Beach, Western Australia, in 2009. Andrea was terrified of her estranged husband, who she had left in 2008. At the time of her death, she had a restraining order in place making it illegal for him to come near her. Charles was on parole from a previous charge for threatening to kill Andrea when he found her. He stabbed her repeatedly in front of one of their younger children. The day before she was murdered, Andrea had called the Crisis Care hotline, run by the WA Department of Child Protection, seeking safe accommodation to protect her and the seven children in her care. Lani Brennan survived years of unimaginable abuse at the hands of her former partner Joseph Timbery. Lani was routinely tortured, raped and assaulted. In 2000, Lani was subjected to almost a year of frenzied attacks, which including being stabbed multiple times with a knife and a chisel, having her jaw smashed, being hit in the head with an iron bar and almost dying several times while being held captive. After leaving Timbery, Lani complained to the police in 2002. Despite the police having substantial amounts of evidence against him, he was not sent to trial until 2006. Lani says she felt like she was on trial and had to fight to have a suppression order of her name lifted so she could speak out against family violence. 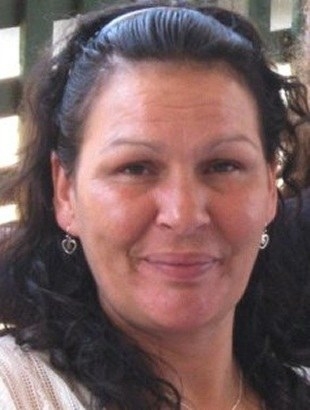 In May this year, Aboriginal woman Adeline Yvette Rigney-Wilson and her two children, aged five and six, were found dead at their Hillier home in South Australia. Steven Graham Peet, Wilson’s partner, has been charged with the triple homicide. Police described the deaths at the time as a domestic incident. Lynette Daley died on 10 Mile Beach on the NSW north coast on Australia Day in 2011 from blood loss following severe genital tract trauma, allegedly at the hands of her boyfriend and his friend. Lynette, a mother of seven, was heavily inebriated at the time of her death and was more than likely unconscious during the sexual acts. A forensic pathologist likened her injuries to someone who had given birth. Manslaughter charges against the pair were dropped after the Director of Public Prosecutions said there was not enough evidence to convict. The men have since been re-charged. The study concluded that more research should be done on the risk factors associated with these potentially preventable deaths so better health strategies could be rolled out. 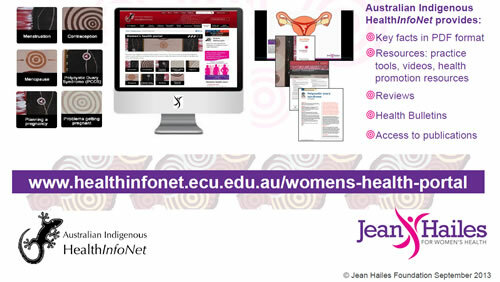 Jean Hailes for Women’s Health is proud to announce the development of a new online health information hub for Aboriginal and Torres Strait Islander health workers. 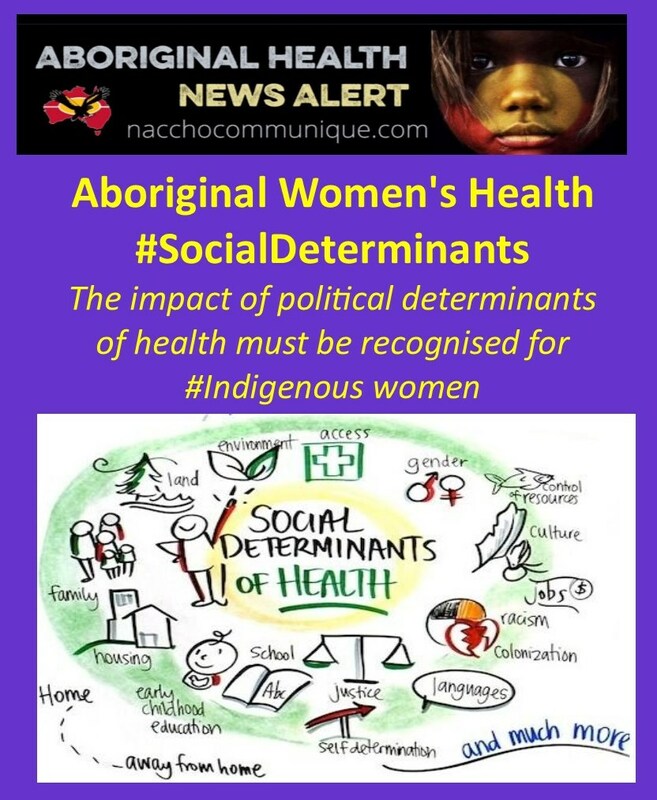 This exciting initiative is being announced at the National Indigenous Women’s Health Workshop being held at Monash Medical Centre on 25-26 October 2013, an event designed to establish key priorities, inform research and provide evidence to inform policy and practice in the field of Indigenous women’s health. Developed in partnership with the Australian Indigenous HealthInfoNet (AIH), the new online resource aims to provide health workers with access to evidence-based key information about a variety of women’s reproductive life stages. Topics include the menstrual cycle, contraception, pregnancy planning, fertility issues, polycystic ovary syndrome and menopause. 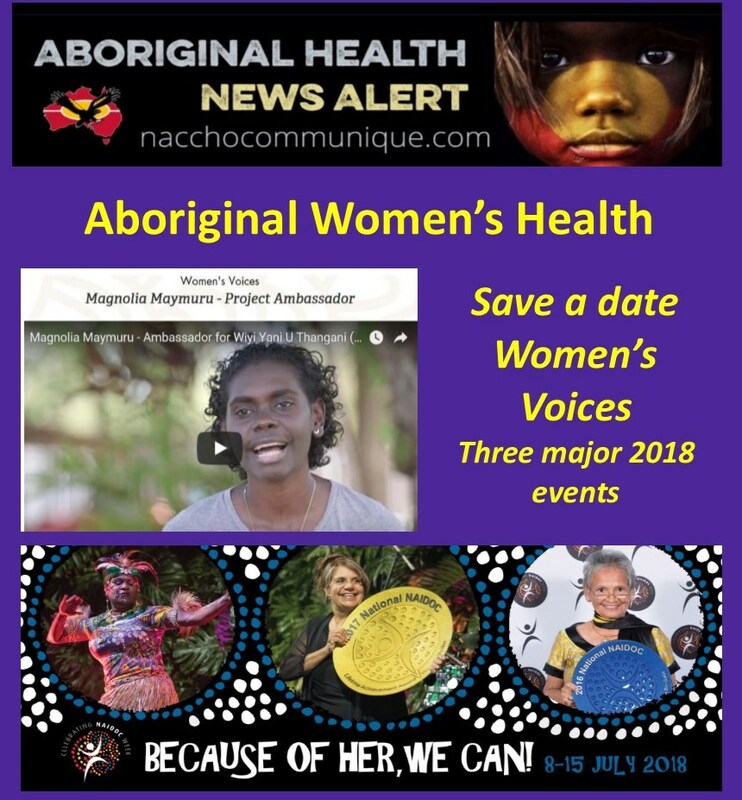 It is hoped the information will assist Aboriginal and Torres Strait Islander health workers to help women understand and manage important aspects of their health, contributing to improved health outcomes and better quality of life. Health professionals and others working in women’s health may also find this online resource useful. 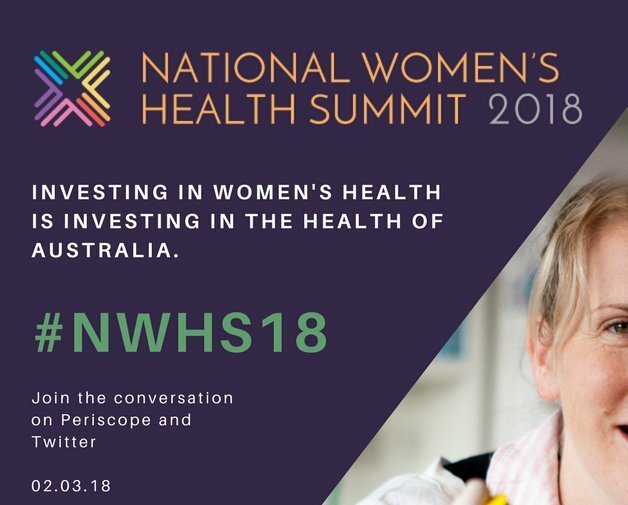 “We hope to build on this resource in the future to broaden the topics around other areas of need in women’s health and wellbeing,” said Louise. NACCHO is supporting Russell Family Fetal Alcohol Disorders Association and FARE’s campaign on alcohol labelling in Australia – we are now asking you to join us. A year ago, Australian and New Zealand Food and Health Ministers decided to place the alcohol industry in charge of developing and implementing their own health warning labels. However, eight months later there has been no mention of how the Government intends to do this. 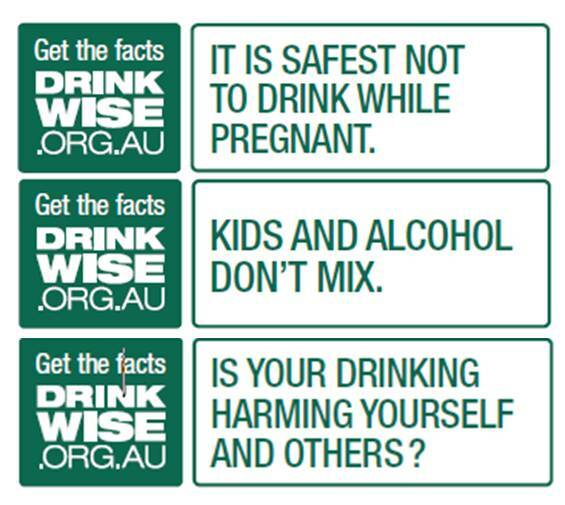 Last week FARE released a commissioned independent audit of the alcohol industry’s voluntary DrinkWise warning labels, and it’s no surprise that the result has been nothing short of a joke. To date, only a small proportion (16%) of alcohol products carry the industry’s labels and when the label is applied, it’s barely noticeable with 98% of the messages taking up less than 5% of the label or face of the packaging. As a result of the Government’s inaction on this issue, FARE has mounted a campaign to ensure that the Government keeps to its word by letting them know that labelling is too important to be left in the hands of the alcohol industry. A key component of the campaign is an online petition to the Chair of Legislative and Governance Forum on Food Regulation, the Hon Catherine King, calling for an evidence-based alcohol labelling regime, which will be delivered to her office on Monday 3 September. The petition has now been signed by over 400 people, including a number of national not-for-profit leaders, health researchers, clinical psychologists, mums and dads, and even journalist and comedian, Julie McCrossin. The campaign has also been featured in the Sydney Morning Herald, ABC TV, ABC News Radio, Nine MSN, AAP, and across a wide range of online media. Remember, grassroots movements succeed because people like you are willing to get involved and spread the word. An independent audit of the alcohol industry’s DrinkWise warning labels has found that a full year after the voluntary initiative was launched, fewer than one in six (16%) alcohol products carry the consumer information messages. The evaluation conducted by IPSOS Social Research Institute also found most DrinkWise messages are largely hidden, with 98 per cent of the messages taking up less than 5 per cent of the label or face of the packaging. Foundation for Alcohol Research and Education (FARE) Chief Executive, Michael Thorn, says the IPSOS audit demonstrates the abject failure of the voluntary industry regime and shows the industry isn’t serious about labelling. “It’s impossible to see the audit results as anything but a complete failure on industry’s part. Twelve months on, and for the most part the DrinkWise messages have simply not been adopted. In the case of the few products that do carry the messages, they are so inconspicuous as to be worthless,” Mr Thorn said. The audit also highlighted a total lack of uniformity and consistency on labelling. When used, industry’s Drinkwise messages were applied selectively. Confusingly, many products were found to have consumer messages from overseas jurisdictions such as the alcohol industry’s United Kingdom’s ‘Drinkaware’ campaign. The audit also found that messages on alcohol products such as the vodka brand that suggests ‘Enjoy with Absolut Responsibility’, were little more than glib advertising tag lines that do nothing to educate and inform consumers about responsible drinking. “The IPSOS audit brings into sharp relief the fundamental weaknesses of industry’s voluntary scheme. What we need are evidence-based warning labels that are applied consistently across all alcohol products. That’s something industry’s half-baked voluntary scheme can clearly never deliver,” Mr Thorn said. 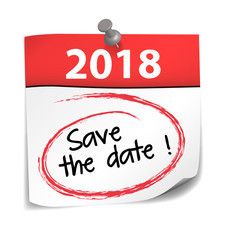 In December 2011, Australian and New Zealand Food and Health Ministers recommended that the alcohol industry would be given two years to voluntarily implement alcohol warning labels, after which time the government would move to mandate pregnancy alcohol warning labels. In the eight months since, Government has shown no interest in evaluating the progress of the alcohol industry’s voluntary efforts, entrusting industry to set its own targets and assess its own progress. “Delaying the introduction of mandatory labels for two years was a mistake, but the government’s current hands-off approach borders on negligence. Industry might wish to set the bar low, fail to clear it, and still award itself a passing grade, but this audit puts paid to that industry spin,” Mr Thorn said. Rather than correct the mistake, Mr Thorn says the Commonwealth now plans on rewarding the alcohol industry further with a tax-payer-funded handout, with the Department of Health and Ageing set to provide DrinkWise with funding to promote its flawed labelling regime. “What is surprising is that in the face of industry failure, the Government seems content to not only let industry continue to take the lead in such an important national health initiative, but now is prepared to throw public funds at industry to promote a largely non-existent labelling initiative,” Mr Thorn said. A new campaign to raise awareness among Aboriginal women about the risks of drug and alcohol consumption during pregnancy has been launched today by Minister for Mental Health and Healthy Lifestyles, Kevin Humphries. 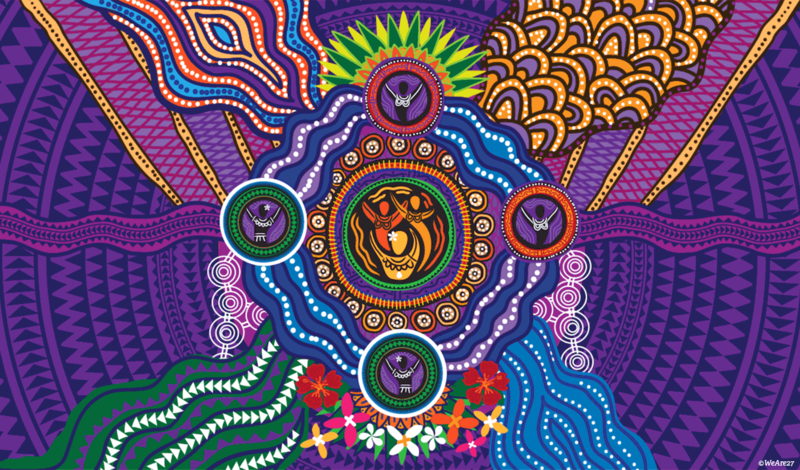 Aboriginal Prenatal Mental Health and Drug and Alcohol Campaign emphasises the role partners, families and communities can play in supporting pregnant Aboriginal women in making healthy lifestyle choices. “The shame, stigma and often a lack of knowledge about mental health and drug and alcohol issues during and after pregnancy are often a major barrier preventing people seeking professional help,” Mr Humphries said. “One of the key messages of this campaign is ‘stay strong and healthy – it’s worth it’ which is a reminder that healthy choices during pregnancy mean a stronger and healthier baby. 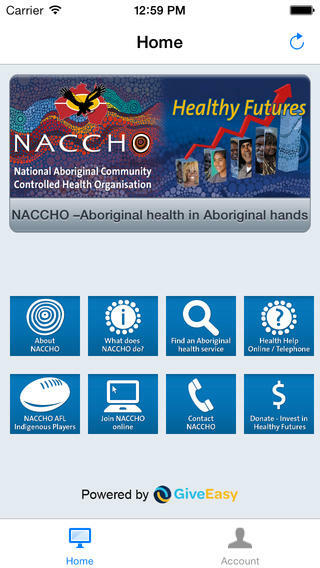 The campaign also aims to raise awareness of services available to pregnant Aboriginal women and their families across NSW. These services include 11 new specialist mental health, drug and alcohol services co-located in Aboriginal Maternal and Infant Health Services in Shellharbour, Taree, Wagga Wagga, Griffith, Gosford, Narellan, Coffs Harbour, Mount Druitt, Dubbo, Walgett and Broken Hill. Aboriginal Obstetrician, Dr Marilyn Kong, said research shows that nine per cent of Aboriginal women will experience depression in pregnancy and this increases to 16 per cent in the year following the birth. The campaign will run until October 14, 2012. Information on drug and alcohol services is available via the Alcohol Drug Information Service (ADIS) on (02) 9361 8000 or 1800 422 599. Information on support services for individuals experiencing depression is available by contacting the Perinatal and Antenatal Depression Association (PANDA) helpline on 1300 726 306 or Lifeline on 131 114.